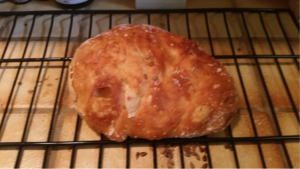 The main reason for this post is to let you know that I baked a loaf of bread last Sunday. That was the main reason for this post…there was something else…but anyway, I recently acquired plantar fasciitis which is not funny except I like to say I have plantar facetious, which is funny, at least to me. Also, I took my first spin class this week and concurrently realized that the new deodorant that I thought was awesome is really not so great. 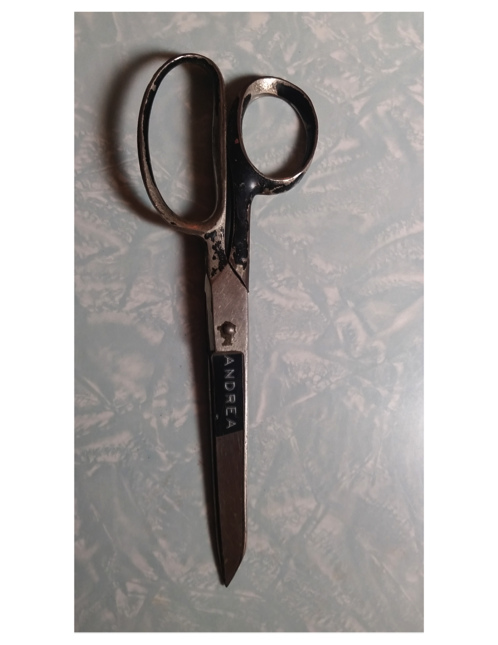 The other notable thing that happened this week was I found my college girlfriend’s scissors, see Exhibit A.
I’m not sure why I still have them 25 years later or what to do with them…Hollenbecks like to keep things, I’ve noticed. I think that is enough about this week. Oh! I almost forgot! Today I’m releasing my new large ensemble recording called All Can Work on New Amsterdam Records. You may find all the info HERE! In case you are interested, I will probably do that spin class again on Saturday (with a different deodorant strategy) and will forego the Sunday bread making because Kate and I will be making our way to New York City for the JHLE CD release concert on Tuesday (January 30th) with an opening set by Theo Bleckmann/Ben Monder Duo! All the info you need you can find HERE! I think you have enough info about me for this week and even next, so I will leave you with the liner notes to the new album if you are the type that likes to read about the music which you will (I hope) listen to! After pondering many titles for this record, I realized All Can Work epitomizes the flexible, optimistic resolve that is needed by everyone involved to do a record like this. This phrase “All Can Work” and the lyrics in this title track are taken directly from the emails in my inbox from Laurie Frink, our beloved trumpeter, whom we lost in 2013. When I first moved to NYC and started playing with and hearing big bands, Laurie was a special thread that wove through them all — it seemed like she played in every band I saw! A master of the short, perfect email reply, Laurie was also the consummate team player, the type of personality that is profoundly needed in a large ensemble. Her sudden death stunned the NYC music community — but the legacy she left behind as the trumpet guru/therapist/doctor to countless brass and woodwind players lives on, continuing to support and enhance the community she served. No matter where I am in the world, I can talk to a trumpet player who had studied with or knows her exercises. “All Can Work” is based on one of these exercises. (Thank you to Dave Ballou for opening up the Laurie exercise archives to a drummer!) After Laurie died, I read all of her emails and then compiled them in chronological order. In her words, I began to see a poem of sorts, and the words helped me keep the focus on Laurie as I started to compose. I really sweated this piece because I wanted it to showcase Laurie’s ever-present humor, her dedication to “the music,” and most importantly our love for her. Thank you to Theo for bringing forth these characteristics of Laurie so beautifully with his voice. The rest of this album is inspired by and dedicated to other great artists that have given me guidance and/or inspiration throughout the years: Bob Brookmeyer, Kenny Wheeler, Billy Strayhorn, John Taylor, William Shakespeare, and Piet Mondrian. This collection is especially personal in that Bob, Kenny, John and Laurie were dear friends of mine who died in recent years. These four artists in particular represent to me a certain type of musician who is authentically humble and unquestionably under-appreciated. My hope is that this recording serves to honor and highlight their undeniable impact on the world of music. Shakespeare, Strayhorn and Mondrian are obviously not personal friends, but have touched me so deeply with their craft that I was inspired to write and/or arrange these works, which helped me dive deeper into their work. “Elf” was commissioned by The Chicago Jazz Festival for the Strayhorn centennial in 2015. This piece was titled and known as “Elf” when it was written in 1963 before it was retitled and repurposed by Duke Ellington as “Isfahan” for the Far East Suite. Because I loved the original feel and arrangement of Strayhorn’s “Elf”, I chose to create something that was a polar opposite. John Wojciechowski (of the Chicago Jazz Orchestra) is to blame for the extremely high register. When I was writing it, I kept asking him if the register was ok and he kept saying it was cool, so I kept going higher! On this recording our own Tony Malaby puts his soprano voodoo on those high notes. “Heyoke” is dedicated to Kenny Wheeler and John Taylor, both of whom I had the pleasure of playing with many times. In the “fun facts” department: I once played in a big band rehearsal when Kenny played lead trumpet — he was giddy at the chance to play lead; and John is responsible for the one time I was not allowed into Canada (a good long story that I can tell you over a tasty cider that you will buy me)! Kenny was featured at the 2011 FONT Festival in NYC and JHLE was thrilled and honored to perform with him for two special nights at the Jazz Standard. I had remembered playing “Heyoke” with Kenny in the past, so I was surprised after receiving the music from him for big band that he had only arranged one of the three movements — the ballad — of that small group version which he recorded on Gnu High. For the FONT Festival, I decided to arrange the other two movements and then segue into his ballad movement. In this recorded version, we stop after the introduction to his ballad, a gesture that I think fittingly symbolizes the incomplete feeling we all had when Kenny and then John departed this earth. Matt Holman, Jacob Garchik and Matt Mitchell share the improvisatory duties with unabashed enthusiasm and sometimes wild abandon. “this kiss” came about from University of Northern Colorado Professor Dana Landry’s ambitious Romeo and Juliet project. I studied Shakespeare in my early years like many other students, but was not mature enough to truly understand his genius at that time. I now have a renewed appreciation for his work after revisiting Romeo and Juliet while composing “this kiss.” I am impressed by the clarity and efficiency with which Shakespeare’s work can convey complex emotional human experience within exacting frames — and specifically how successfully he did so within a sonnet form. He did not waste a single word, nor did he allow the strict form to limit his creativity of expression. Inspired mainly by the concise precision with which Shakespeare penned one of his most famous sonnets, I created a simple Romeo motive, a simple Juliet motive, and a concise musical theme based on this sonnet form. I developed the material as if I was scoring this scene for film, quickly cutting from intimate conversations to full dance scenes. I treated the individual musicians as if they were the individual characters from this passage. Sometimes they interact in small groups, sometimes large (as in the dance scenes), and sometimes there are small and larger conversations going on simultaneously. The material is put together to meld a mood of sweet romance in the present with a foreboding dissonance that foreshadows the future. My title “this kiss” uses these two significant words that both Romeo and Juliet recite in the opening stanzas of their sonnet. Matt Mitchell does his own freestyle dance around the band in a later section that represents the sweet tenderness and excitement of these two lovers. “from trees” was commissioned by the Philadelphia International Festival of the Arts and was premiered by the University of the Arts Big Band under the direction of Matt Gallagher with original choreography by Netta Yerushalmy in 2011 in Philadelphia. Having always liked Mondrian’s later works, I chose for the first time to delve into his earlier works and immediately noticed his studies of trees. For this composition, I chose three works that encompass his oeuvre: “The Gray Trees;” the cubist-inspired “Composition with Oval;” and his last unfinished painting (in the De Stijl style) “Broadway Boogie-Woogie.” I incorporated a boogie-woogie feel into the whole piece while trying to evoke the development and evolution of the lines of a tree in his earlier paintings to the bold straight black lines in his last painting. In this recorded version Dave Ballou and Tony Malaby are creating their own paintings on my compositional canvas. “Long Swing Dream” started as an actual dream. For the first and so far only time, I dreamed an actual piece. In my dream, the bass line was the focal point and the horns mostly passed around this one long note. Realizing later that the initials for this title are LSD, I found some curious Cary Grant musings about his own transformative experiences with LSD and added them to deepen the dream-like effect. The first piece on the record, “lud,” is one of those intangible pieces that just popped out recently. I don’t have an explanation for it but I wish I could write more music like this. And by “like this” I mean strangely alluring, or alluringly strange. The title I came upon by chance, perhaps when looking for words that rhyme with dud? I like this title because it is either means “Lord,” as when addressing a judge, or it is an acronym for Local Usage Details (a record of local calls from a particular phone number), or perhaps it is first name of a famous Russian jazz bandleader. Either way, this piece and I are now good friends, so I intend to further develop this into a concert length work in the future. “The Model,” a Kraftwerk classic was suggested by Theo Bleckmann for my Songs I like A Lot album and since that time it has been a fun piece to play live with various bands. And I think it is a nice way to leave you — hopefully it will make you move and sing…and come back for another listen! I have not yet been able to pen a fitting tribute to Bob Brookmeyer — and I’m not sure that I can, or if one composition would even be enough. So I dedicate this entire album to him, because it simply would not exist without him and I miss him terribly. The John Hollenbeck Large Ensemble was founded in 1998 to exclusively perform my compositions and arrangements. After two successful Grammy-nominated recordings and tours in the United States and Europe, this third recording project represents the accumulation of years rehearsing, recording and performing together. It represents the definitive evolution of an exceptional ensemble that has developed a relationship akin to family. I have been playing with some of the musicians in the band since high school and college — they are loyal, long-standing members, who are leading musicians in creative music in New York City and successful musicians in their own careers. They make all of the hardships of leading a large ensemble worth it! The legendary James Farber expertly recorded the music at Avatar Studios in NYC. Avatar was sold shortly after the session and its future is unclear, so we were very happy to record there one last time! With James’ steady ears and meticulous preparation the session went smoothly and even at times was, I dare say, enjoyable. James was ably assisted by Nate Odden, who besides doing the right thing at the right time, also gave me some great secret email tips that I will use from now on! Handing the session mixes over from James to Brian Montgomery is such a smooth transition — they have worked together for years and know each other’s work so well a synergy has evolved. Mixing with Brian and the ever-present, ever-cute Cody the dog was a blast! Brent Lambert at Kitchen Mastering came in at the end and sprinkled all of the right kinds of audio pixie dust onto Brian’s mixes. As I’m writing these notes, I have not yet seen the cover design by Karlssonwilker, but I’m positive that it is super cool and super fun, because it always is. This project was supported in part by the Doris Duke Performing Artists Awardand fiscally sponsored by Arete Living Arts Foundation with funding provided by The Aaron Copland Fund for Music.